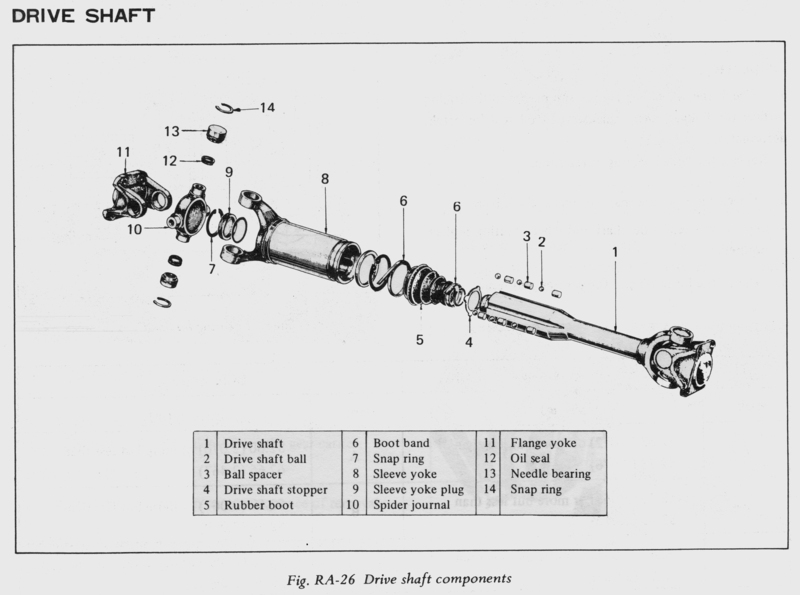 Rebuilding the Datsun 240Z half shafts or Drive Shafts (per Datsun FSM) – is indeed a do-it-yourself project. There are tons of references on the internet, and I’ve made several of the links available below. I have rebuilt the half shafts in my 1971 Datsun 240Z. I took a bunch of photos of the dis-assembly and re-assembly, and added copious notes about my experience. An exhaustive list of cross-referenced vendors of U-joints for both the half shaft and drive shaft can be found on ZCar.com and on AtlanticZ.ca. I did not compare the content of these two sources. Here are all the parts ready for installation. Two extra u-joints are for the drive shaft. Everything was not as it seemed! Read the caution, below. Inspect all the parts when you get them. I received 4 boxes of 393 u-joints, but only 3 actual 393 u-joints. One had 29mm caps instead of 28mm. Called local O’reilly retail store (Friday 11am), and did a straight exchange over-the-counter Saturday at 11am – just as the promised! One of the three U-Joints was the wrong size. Jack the rear of the car onto axle stands. You will need to remove the 8 bolts (4 at each end) that secure the half-shaft at the differential end and at the rear wheel. If you start by the wheel, leave two bolts & nuts in place (finger tight) so the half-shaft is not flopping around while you try to remove the bolts at the other end. Not an issue if you start at the differential end. You will need to remove one bolt, spin the shaft, remove one bolt, spin the shaft, repeat. The connection at the differential end required some work with my 2.5 pound sledge hammer to get the two parts to separate. There isn’t a lot of ‘swinging room’ and the joint is very near the diff, so be careful and patient. Many years and a little bit of rust is all it takes. 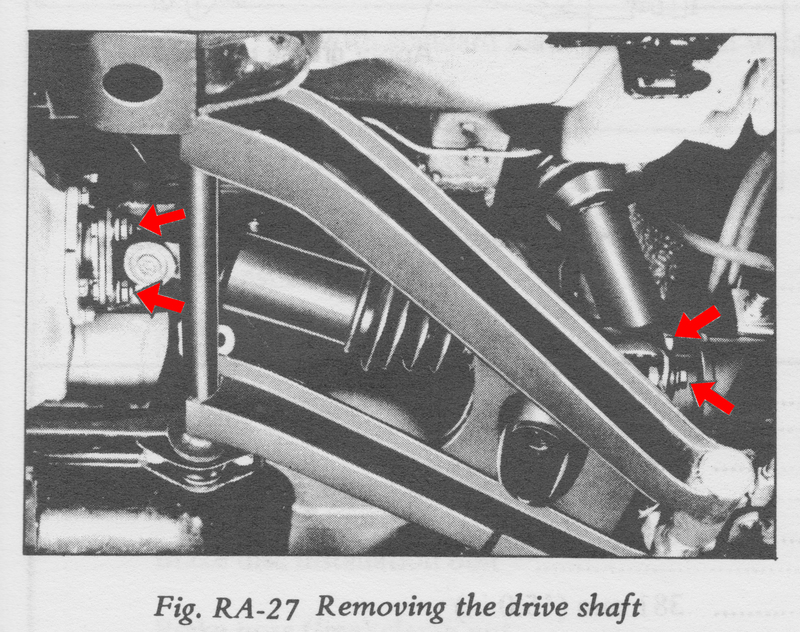 I found this great reference on removing U-Joints from ClassicZCars.com. “Change a U-Joint with a hammer” http://youtu.be/8jpME2VD1oA. I used a vise and my 2.5 pound sledge hammer to remove the u-joints. Worked fine. Go slow, make sure everything is lined up. U-Joints came out easily (large hammer method). The bearings were loose, not sloppy, just loose. The seals most likely were shot - very little grease left - and examining the underside of the car it was clear these had been slinging grease. Here are the three components after U-Joint removal. The yellow paint stripes tell me that somewhere along the line, these may have been junk-yard finds. Looking in the "back end" (differential side) is a large clip ring that secures the rear dust cap/grease seal. Here is where a decent set of snap-ring pliers earn their pay. Gently collapse the half-shaft assembly and the end cap/grease seal will be displaced. Remove and set aside. It may feel stuck, but it is just the 'sticktion' of grease. Under the grease cap is a snap clip and the Drive Shaft Stopper (#4). This is the Drive Shaft Stopper (#4) with the clip ring removed. The 'other' side of this part has a bevel on it. Watch for that during reassembly. Here is a "mash-up" of two photos to show the components in order of (dis) assembly. Remove the bands that secure the rubber boot. These boots are in excellent condition, still flexible, no tears, no signs of wear. Pull back the rubber boot and start to pull out the center shaft. Here is a shot "down the barrel" where the bearings and spacers are seen. Under the grease in the foreground is another clip ring. After wiping away some of the grease, the last clip ring can be seen. Remove it to make it easier to slip out the bearings and spacers. Here are the parts in order. Here is the center shaft thoroughly degreased and cleaned. Inspect for signs of wear. Mine look great. Here are all the 'innards' all cleaned and awaiting reassembly. By this definition, I am now a “half-shaft expert”. Please learn from my mistakes and follow the learnings in the slideshow below. Parts stripped, glass bead blasted, ready for primer. Parts primed with 2-part epoxy primer. Step 2 of 3 - pull the Rubber Boot all the way onto the smaller part of the drive shaft. See the part of the Rubber Boot in the red circle? You MUST get this right-side out BEFORE you go any farther. Rubber Boot step 3 of 3 - now turn the Rubber Boot right-side-out and start to pull it back off the Drive Shaft. Only pull until the end (in the red circle) flips right-side-out as shown here. Then slide it back into position. Slip a large clip ring and bearing retainer BEFORE you add the bearings and nylon spacers. Liberally grease the tracks for the bearings and press in the bearings and spacers in the order shown in the manual (Figure RA 26). Carefully slide the Drive Shaft into the proper end of the Sleeve Yoke. Keep the alignment so the U-joint mounts are in the same orientation. If you can have someone hold or otherwise secure the Sleeve Yoke, it would be helpful. Slowly work the bearings and Drive Shaft in. This takes time and patience. Insert the bearing retainer and snap ring. Push the Drive Shaft so the end sticks out the back of the Sleeve Yoke. Install the Drive Shaft Stopper and snap ring. IMPORTANT: The Drive Shaft Stopper is free to rotate - be sure to align it in the same channels as the ball bearings are in before you push the shaft back in. Add extra grease and install the Sleeve Yoke Plug and clip ring. Pull the Rubber Boot into place and secure with band clamps. 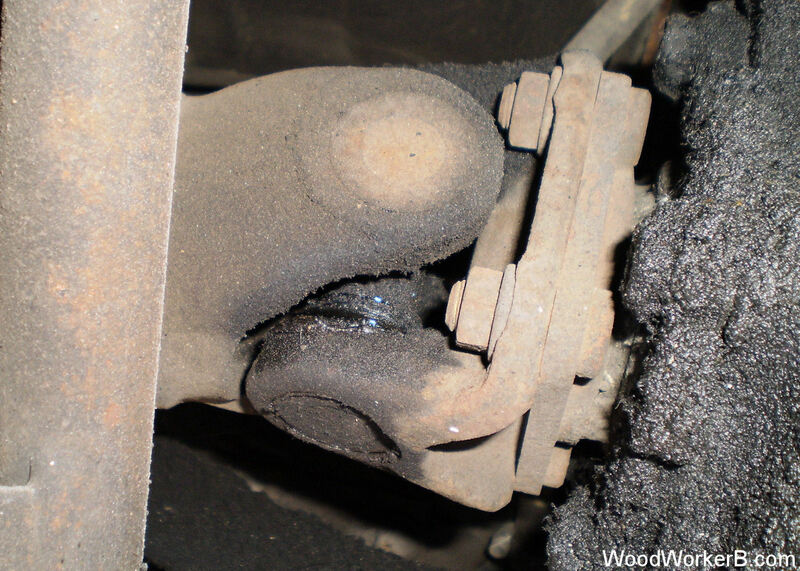 Here is what one of the half-shaft U-joints looked like when I first bought the car. It is pretty obvious that the u-joints were already leaking a LOT of grease back then.